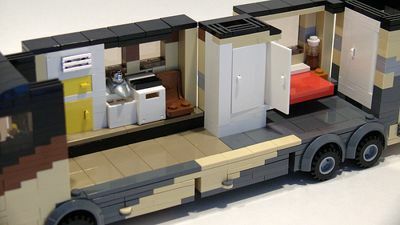 There are a lot of RV travel tips out there, but when we came across these simple, low cost tips on DoItYourSelfRV.com for getting your RV ready for Summer travels we had to share them. We hope they inspire you to get your RV out and ready for all your upcoming Summer fun! Some of these tips are time tested and general reminders, while others may surprise you! We hope you find a little of both in the list below! Flush out the water lines. Be sure to add a tank cleaner/freshener product to get rid of any lingering bacteria that worked itself into your system. We know that many people use bleach in their tanks then run the faucets till they can smell bleach. They then let it sit for 24 hours then flush the system before refilling for use. Quickly spot check that all the interior fixtures and appliances are working. Both electrical and gas appliances should be tested. If you notice any issues then call a technician immediately, especially if you smell gas. If you have ever seen a pop-out in a RV park with a modified children’s pool toy on its edges than you may have seen this idea without realizing it. This modified toy idea helps to save your back, head, and appendages from getting gouged by your pop-out while walking or working around them. Simply take apool noodle and cut it on one edge then cut it to length to fit the edges of your pop-out and they should slider right on then right off for removal when necessary. The warmer temperatures in the summer tend to put additional stress on your batteries. They tend to discharge quicker and require more topping off of fluids than during cooler months. You should try to check the fluid levels in your batteries regularly to give them the longest service life. Read more on Battery Maintenance. Most generators are tough enough to seem like they don’t need maintenance but they certainly do. They need their oil changes, filter replaced, air filter checked just like any other engine. Be sure not to overlook this key feature of your RV. Take some time to plan for how to handle your RV and your passengers if bad weather strikes. It usually helps to grab a elevated campsite away from trees if possible. Before you set out on your trip be sure to get some good photos of the interior and exterior of the RV in preparation for any damage that may occur. Grab a waterproof container or document file to place any important documents in your RV. Be sure to have an emergency kit in the RV. Water, food, other personal necessities are a plus. Get a good feel for how to find the integral functions of your RV in the dark (Flashlight). RV etiquette is a subtle art form. Whether your on the road or at a RV park. Treat other how you would expect to be treated. Be a polite as possible, try to be reasonable, and keep your calm. If everyone adhered to this rule RV’ing would be much more enjoyable. We have been guilty of breaking this rule but we can live without the issues that inevitably erupt from time to time. If you have any tips you would like to share please comment on our Facebook page or send us a message us!